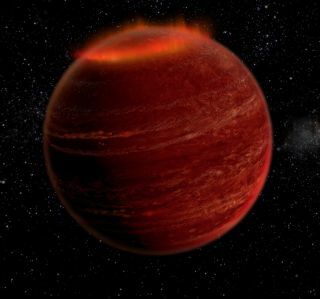 An artist's concept of brilliant auroras on the brown dwarf LSR J1835+3259, a misfit failed star about 18.5 light-years from Earth. The auroras are the first ever detected beyond our own solar system. An alien aurora 1 million times brighter than Earth's, robots building a moon telescope, a $5.5 billion asteroid and more in Space.com's top news stories of the week.